Bangkok is a bustling metropolis that never sleeps. It has everything that you would expect from a real world metropolis. It is modern, full of great Bangkok is a bustling metropolis that never sleeps. It has everything that you would expect from a real world metropolis. It is modern, full of great food and there are lots of things to see and do. This is a personal travel guide to Bangkok, to help you both before and during the trip. Here you can read about sightseeing in Bangkok, how to get around, recommended hotels and other things that can be useful to know. 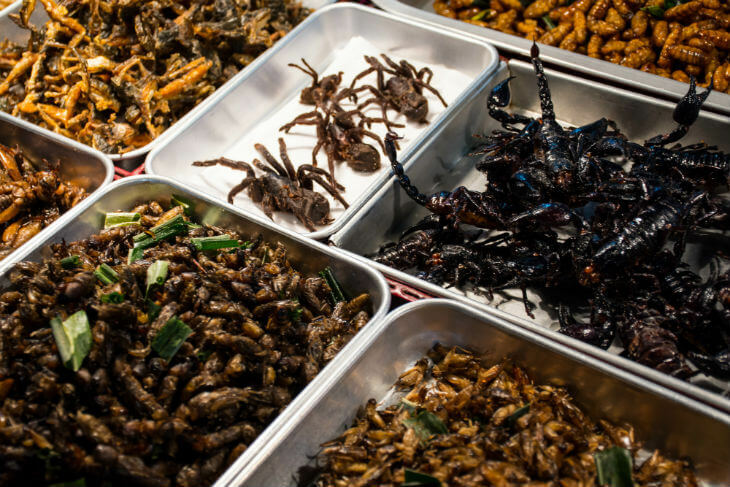 A backpacker area that has become known around the world, much thanks to its exotic menu of beetles, scorpions, spiders, snakes, grasshoppers and other critters. Khao San Road is almost a must to visit, at least if you’re a backpacker. This area has everything you would want to buy and a whole bunch of like-minded travelers who are preparing for a crazy party night. A large part of Bangkok’s population are of Chinese descendants, and it’s really no surprise that Bangkok is home to one of the world’s largest Chinatowns. Here are many things to explore, but it’s mostly the massive amount of food that attracts visitors. These three sights are some of the most famous landmarks in Thailand. Tourists usually visit all three on the same day since they are very close to each other. Wat Pho is a fantastic temple area with a rich history and many beautiful temples and stupas. The temple area is perhaps best known for the giant reclining Buddha statue. Wat Phra Kaew is located inside the palace area, and this is where you will find Thailand’s most sacred Buddha statue – The Emerald Buddha. The Grand Palace is also considered a holy place and you will not be allowed to enter if you don’t follow the dress code (no shorts or tank tops). The palace has been home to several of Thailand’s kings, and it’s truly majestic. Visiting a rooftop bar is definitely something one should do when visiting Bangkok. There’s a wide variety of rooftop bars, and they come in different price ranges and altitudes. Here are ranging from exclusive rooftop bars to the most mundane places where dress code is less strict and prices lower. Some of the most famous rooftop bars in Bangkok are Vertigo and Moon Bar, Sirocco, Red Sky, Park Society and Distil. For those with a lower budget, I can recommend Wanderlust and Nest Rooftop Lounge, which is more casual and have lower prices. For those who want to experience something different and exotic, I can recommend visiting a floating market. 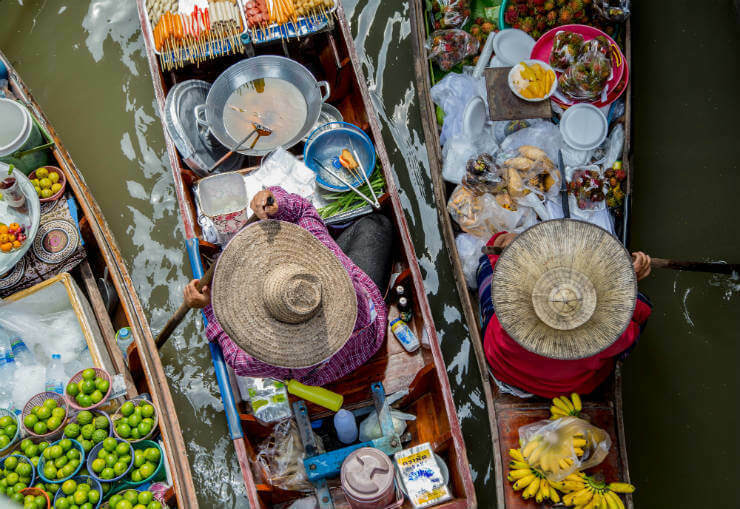 Bangkok has a couple of floating markets to choose from, and it’s a perfect day trip to get a better insight into the local culture. Although there are two-three markets around the city, you will find the largest floating markets about 1-2 hours outside the city. The biggest floating markets are Bang Khu Wiang, Damnoen Saduak Khlong Lat Mayom, and Amphawa. The best way to get there is by booking a trip through a travel agent. You can also get there via public transportation, but it is much easier to go there on the tour. If you like shopping, then you will love Bangkok, especially if you’re a girl. Bangkok has everything you can imagine with everything from exclusive designer boutiques to international chains like H & M, Zara, Pull & Bear and of course all the local markets and shops with lots of different clothes. Bangkok’s largest shopping malls are Central World, Terminal 21, MBK, Gaysorn, Siam Center. Failure to time so that you are in Bangkok over the weekend so do not miss to visit the Chatuchak Weekend Market, which is Asia’s largest market. However, If you’re a guy, you might find some limitations when it comes to clothes. The same applies you’re a long or a larger girl/woman since sizes are specially adapted for Thai women. To get around in Bangkok is easy and you have plenty of alternatives. There is metro, bus, taxi, BTS (skyline), tuk-tuk and of course by foot. Just as the name suggests, this is a train that goes up in the air. Bangkok’s BTS is super smooth and has two lines serving the central parts of the city. The sky trains are air-conditioned and offer a quick and easy way to get around. They are an attraction in itself! Metro system covers the parts without the sky train and also offers more stations to hop on and off. The Metro is also cheaper than the BTS and works just as smoothly. When I’m in Bangkok, I always use either the Metro or BTS to get around. It is cheap to go by taxi, and there are plenty of them. If you’re more than two traveling it may be cheaper to take a taxi rather than Metro and BTS. But be sure to use the taxi meter. It is the law that one should have the meter on, so if the driver doesn’t want to use taximeter, then it is almost a guarantee that the driver is trying to scam you. 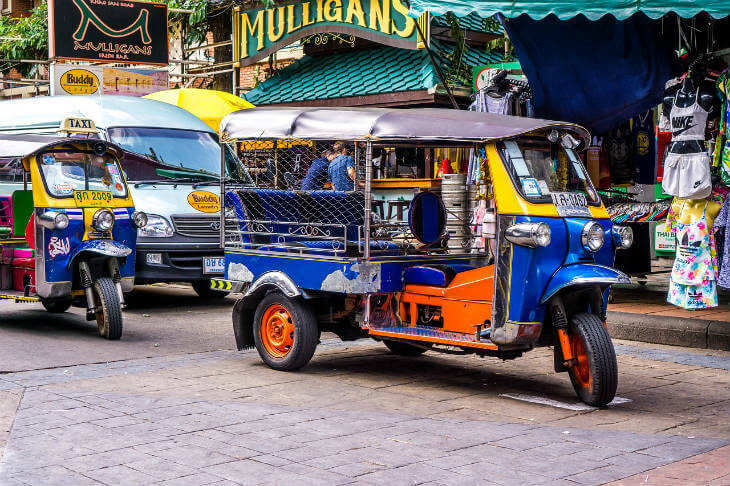 Thailand is known worldwide for its tuk-tuks and Bangkok is completely crawling with them. While it’s fun and different to go with this, you should be aware that there is both a safety risk in traffic, and many drivers are trying to lure tourists. Getting around by boat can be a good option if you want to explore the area along the Chao Phraya River. Several boats and ferries go up and down the river. The cheapest cost from 3 THB, but it is also possible to buy a full-day ticket or to rent your own boat. A note of caution, for people who try to sell you expensive tickets. A one-way ticket should not cost more than 40-50 THB per person. A luxurious option with ultra-modern rooms and fresh décor. From here you are close to the Chao Praya River and Lumphini Park, and it is easy to get to other parts of the city. At the top, you will find the most glamorous rooftop bar in Bangkok. Hotel guests also have access to an outdoor pool and gym. The breakfast is delicious and plenty of varieties. The staff is helpful and keeps a high level of service. A modern and clean hotel in the middle class to suit both business travelers and tourists. Wi-fi is fast, and the staff is pleasant and helpful. The hotel lies in the area of Silom, and it is easy to get to other parts of the city by metro or bus. Red Planet Surawong is the perfect choice if you want a high standard but still want to keep the price down. Red Planet Surawong is undoubtedly one of Bangkok’s most affordable hotel. If you are traveling on a lower budget, or would rather spend your money on activities and food? Then SidaRe the ultimate place to stay in Bangkok. It’s a family-run guesthouse with simple standard close to both the metro and a direct train from the airport. A room costs under 15 $ per night, so it’s perfect if you do not want to stay in a hostel with shared rooms, but still want to keep down the cost of accommodation. Bangkok is arguably the world’s capital when it comes to street food. To be honest, I have never seen so much food that is available around the clock. Here is everything from regular restaurants to fast food restaurants and small stalls selling street food such as skewers, noodles, and various rice dishes. Best of all? Street food is incredibly cheap, and it’s both delicious and safe to eat. Bangkok has all kinds of Thai food one can imagine mixed with dishes from other Asian cuisines and dishes from around the world. Direct Flights to Bangkok from Europe will take approximately 9-11 hours. Time zone: GMT +7. A difference of 6 hours ahead compared to Central Europe. Thai Bath (THB). Credit and debit cards are generally accepted at more well-known hotels and restaurants, otherwise not so much. However, there are plenty of ATM:s, but remember it’s better to take out a larger sum since all Thai banks have a fee of 200 THB, no matter what card you use. Tap water in Bangkok is not safe to drink. Vegetables and other things that have been rinsed with tap water should also be avoided to prevent diarrhea and other nasty things. It is safe to brush your teeth with tap water, but sensitive people should still avoid it. Approximately 8.5 million people in urban areas and 15 million in the metropolitan area. Thai. The majority who work with tourism speaks English. Otherwise, only mostly simple English or none at all. Some citizens also speak Chinese. In Thailand you can stay online and save up to 95% on data roaming charges with 1GB smart data package. TravelSim has free incoming calls and sms in Thailand. In case you don´t have a TravelSim sim card, it can be purchased here.